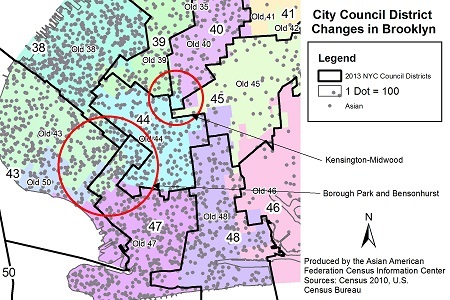 Tuesday, July 23, 2013, New York, NY— Today, the Asian American Federation released a briefing paper that details the Asian population, ethnic breakdowns and the major Asian languages spoken in each of the 51 Council Districts based on new lines finalized in May 2013. “As discussed in our demographics report in April 2012, the Asian population remains the fastest growing in the City,” said Howard Shih, Census Programs Director at the Federation. “But to see the Asian American community as monolithic would be erroneous. The population numbers disguise the diversity of our population. With the upcoming City elections, term limits, and with many of the Council Districts slated for new representatives, we hope this will be a useful tool for the incoming City Council to better serve our Asian community,” added Shih. In addition to one majority Asian district, eleven other districts had more than one in five residents who were Asian. Four City Council Districts were home to a very diverse mix of Asian ethnic groups. Each of these districts had seven or more different Asian groups who each had populations of more than 1,000 people. The diversity of Asian languages spoken in the city is a particular challenge when reaching out to the community. “This report is an invaluable tool that will serve to help elected officials better understand the growing Asian population in New York City,” said Council Member Daniel Dromm, who represents Jackson Heights, Elmhurst, and East Elmhurst. Dromm’s district, one of the most ethnically diverse areas in the City, saw an increase of over 8,000 Asians in the total district population. “The data in this document provides key insight into my district that will enable me to better communicate and understand a vital part of my constituency”. 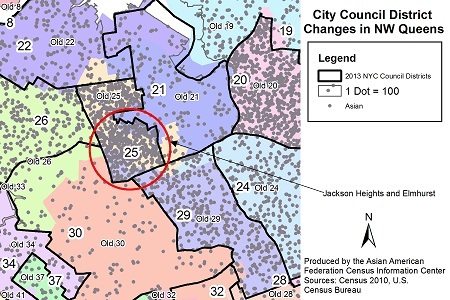 As the briefing paper points out, Council District 20, centered in Flushing, remains the district with the largest Asian population at 66% of the population. “While I represent the largest Asian population, it is important to note that Asians are living throughout the City. The myth that Asians live in identifiable enclaves have long been dispelled. Our city leaders have to be mindful of the diversity of the Asian community, from languages spoken to the cultural practices,” said Council Member Peter Koo. “The onus is on us – the elected leaders- to hear their issues, address their concerns, and make room for them to contribute to their neighborhoods,” added Koo.